We hear from Emma Preece. When Emma Preece returned to work at Her Majesty’s Prison and Probation Service (HMPPS) as a Band 7 Registered Forensic and Occupational Psychologist, she really noticed that 'You feel valued and trusted as a professional, allowing you to be flexible in the way you work.' Emma has dual chartership, having taken a master’s in occupational psychology before qualifying in the forensic speciality. She had left HMPPS in 2006 to work independently (‘I had young children and wanted a career break without stopping working, if that makes sense’) but returned in September last year. What does her present job involve? ‘I don’t think there’s a “standard day” for anyone. I’d stress to any candidate that the work is very varied. Of course, a great amount of time is taken up with risk assessment work for the Parole Board. But I also assess people to develop treatment pathways (I’m doing some cognitive functioning assessments at the moment) then communicate these to other professionals. We’re also providing consultancy to help develop rehabilitative cultures in prisons. Forensic Psychologists in Training have been assessing organisational cultures in prisons and working with prison governors. I have been collating the results across the North West region, feeding this back to relevant stakeholders and conducting staff workshops to identify the way forward. The emphasis on rehabilitation in our service drives constant change – we’re looking for patterns which might give keys to successful rehabilitation cultures. Emma, if you had a good candidate in front of you, what would you say about the benefits of working at the HMPPS? ‘Well, there are about 50 psychologists in the North West region and every single one is prepared to help and support you. They’re a very experienced and positive team who are keen to work collaboratively. Second, psychologists are valued by others in the service: prison governors genuinely welcome our advice, for instance. ‘While mine is not a research job, if you spot a research opportunity or come up with a good idea, it’s welcomed. I know colleagues that are working towards a doctorate who have been supported by the prison service. There is a strong emphasis on keeping up-to-date with latest research: we stress evidence-based practice, and this is another element in the drive to move forward and constantly improve. 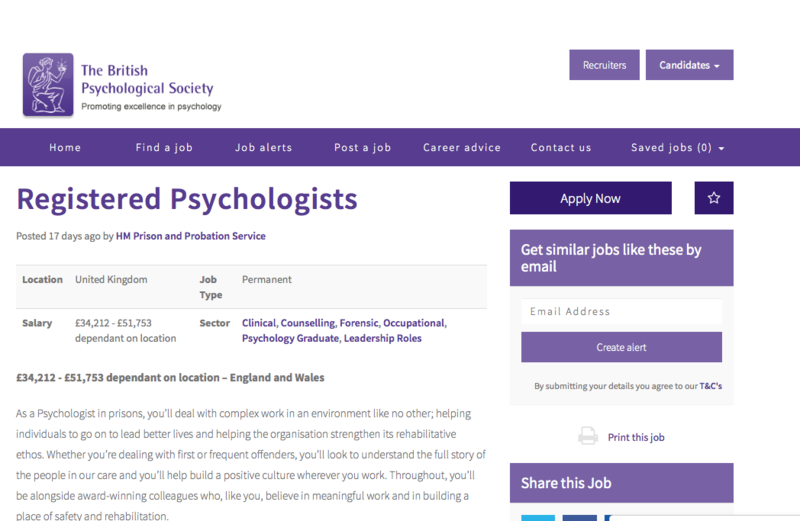 ‘Given such a large group of psychologists, CPD is critically important. By next week I’ll have been on four courses since I returned in September as well as a conference. Good professional supervision is also vital to ensure a high-quality service. Our recommendations can have far-reaching consequences and therefore peer supervision is important.